The San Jose Sharks must have liked what they saw today in Gustav Nyquist’s game. The team has acquired him from the Detroit Red Wings after seeing him in person today in exchange for a 2019 second-round pick and 2020 conditional third-round pick. Nyquist scored one goal and recorded eight shots in more than 20 minutes of ice time in a 5-3 loss against the Sharks. In order to complete the trade, Nyquist was required to waive his full no-trade clause. If the Sharks reach the Stanley Cup Final this season or re-sign Nyquist, the 2020 pick will become a second-round selection. Nyquist, 29, now has 16 goals and 49 points on the season and is closing in on his career-high of 54 set back in 2014-15. 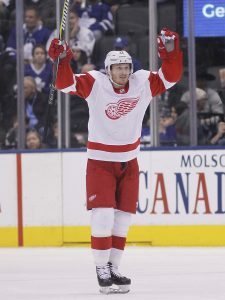 The talented winger was perhaps the best expiring contract the Red Wings have left after already sending Nick Jensen to Washington, and they will gather even more assets for their rebuild with this trade. The veteran forward comes with a $4.75MM full season cap hit, though his actual salary is even more. This season Nyquist is earning $5.5MM of the $19MM he signed for in 2015, though Detroit will be retaining 30% of his remaining contract. Over the last few seasons the Red Wings have consistently turned their former core players into younger or future assets as they look towards Dylan Larkin to lead the next wave of talent. Nyquist, Jensen, Tomas Tatar, Petr Mrazek, Riley Sheahan, Brendan Smith, and Thomas Vanek (who eventually re-signed in Detroit) have all been shipped out since the beginning of 2017 for a total of eleven draft picks all in the first three rounds. That kind of turnover is allowing the team to rebuild through their own development system, though they so far have not experienced much on-ice success in terms of the NHL standings. Detroit once again is expected to finish near the bottom of the league and should be selecting in the first half of the round in June’s draft. For the Sharks, adding another offensive talent like Nyquist is just another sign that they believe they can compete for the Stanley Cup this season. The team had already spent big on Erik Karlsson in the offseason but had been open about the fact that they were willing to shop in the rental market. Remember though, GM Doug Wilson often extends the players he goes after through trade, most recently with Evander Kane. Nyquist ended up at #14 on our Midseason UFA Power Rankings, and with a career year and potential long playoff experience is setting himself up for a big pay day. With the win today, San Jose will wake up tomorrow with the third-best record in the entire NHL at 37-18-8 and armed with another talented player to insert into the lineup. Nyquist has experience on both wings and has previous success on the powerplay. Unfortunately there is still a question mark about his playoff performance to date. 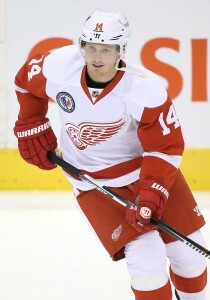 In 35 games Nyquist has recorded just eight points, though obviously that could change with the new uniform. That’s what the Sharks are hoping for, as they push all of their chips to the middle of the table. In a competitive Central Division, the rivalry between the Winnipeg Jets and the Nashville Predators may head directly into the trade deadline as TSN’s Pierre LeBrun reports that the two teams may go into an “arms race” over acquiring deadline rentals. Not only are both teams expected to be active at the trade deadline, both teams could find themselves competing for similar targets. Both teams battled each other right through the playoffs last season as Winnipeg came out the victor, knocking off Nashville in the Central Division Finals before being eliminated by Vegas. However, that rivalry has continued as they both are the top two teams in the Central, deadlocked with 64 points at the All-Star break. Winnipeg sits with a 31-15-2 record, while Nashville has a 30-18-4 record. Both teams struggled with injuries in the first half, but both teams are looking more and more healthy and both teams should continue to battle for the top spot in the division for the remainder of the season. However, LeBrun reports both are ready to give up prime assets to acquire quality rental players. One of the players that is often mentioned that both teams have shown interest in is center Derick Brassard, who Winnipeg tried to acquire last season at the trade deadline from Ottawa before the Penguins stepped in and acquired the veteran forward. However, other names that have come up recently suggest that both teams may also be interested in Wayne Simmonds, Kevin Hayes, Gustav Nyquist and Marcus Johansson.